Posted by Jon in McFarlane Toys, Review, Stranger Things with 0 comments. Why do I do this to myself? Every couple of years a McFarlane Toys action figure will manage to catch my attention, and like an idiot I’ll go ahead and buy it. I know better too. It always plays out the same way, as soon as I open the figure and start to handle it, the regret seeps in. I suppose that I just need to reinforce these life lessons every now and again. Stranger Things first became available to watch through Netflix in July of 2016. Since then the internet hasn’t taken a breath to stop talking about it. I enjoyed the first season quite a bit, but I could have done without the constant, almost obsessive, analysis. The second season became available this past October, and it appears to have cooled everyone’s jets. There isn’t nearly as much discussion surrounding this new season. Which is fine because maybe the writers won’t feel as much pressure to replicate whatever worked in the first season. Chief Hopper and Eleven are the first proper (non-Funko) Stranger Things action figures. McFarlane Toys looks to be committed to this line as we’ve also seen prototypes of the Demogorgon, Dustin, and Lucas. I’d like to think that they rushed these out to hit retail shelves in time for the first season’s DVD release. But these feel like every McFarlane figure I’ve ever bought, so there probably isn’t any excuse as to why it is the way it is. As far as Hopper’s sculpt is concerned, I really don’t have any issues there. McFarlane loves to leave those ugly pins exposed at the hips and shoulders, but otherwise it’s a fairly clean sculpt. They did a pretty good job capturing the likeness of David Harbour. The only complaint I have there is that the face printing makes him seem a bit lifeless. On that subject, I would suggest not ordering these figures online. The Hopper I picked up has decent paint, but at the Target I found him there was another Hopper with really bad smears all over his face. Both of the Elevens had the same issue which kept me from grabbing her. Well that and I wasn’t ready to invest another $20 into a McFarlane figure. It looks as though McFarlane is going for a similar 7″ – 8″ scale that NECA uses for their figures. He’s much taller than a Figuarts or Marvel Legends figure. But he seems to fit in pretty well with the NECA Aliens figures I have hanging around. At least they aren’t trying to make these in that weird 5″ scale that literally fits with nothing. For a figure that boasts as many articulation points as it does, Hopper is a real chore to find a good pose. First off, I’m not even sure what kind of ankles he has because they feel so tight that I’m afraid that they will break moving them around too much. Both the knees and elbows have swing-swivel joints, which is good, but when bent they expose the giant ratchets inside, which is not so good. The head is on a ball joint that gets okay range, at best. All around, I just wish his articulation had more useful range, and that the joints didn’t feel so fragile. It’s also worth noting that he was solicited with two heads, one hatted one we got and a head with no hat. I guess that second head never made the cut, or will end up as an exclusive somewhere? 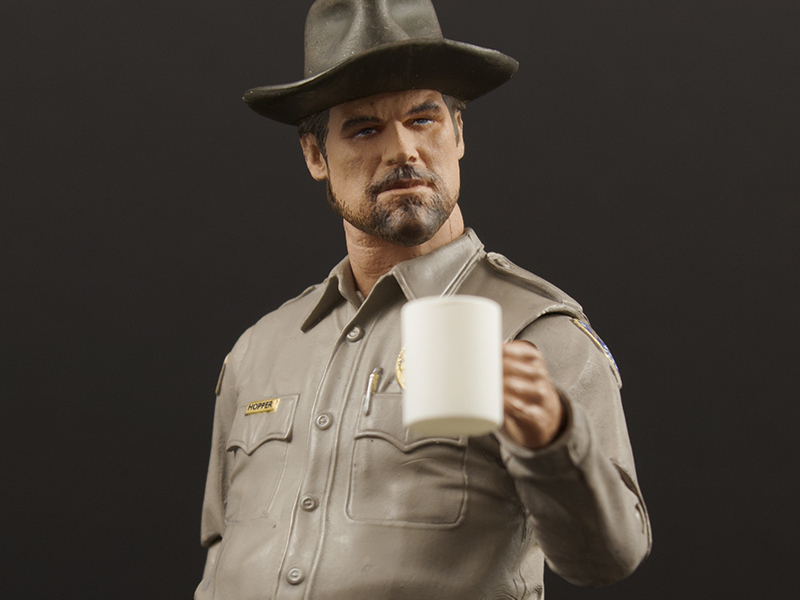 Would I recommend McFarlane Toys Stranger Things Chief Hopper? I will say this about the figure, while I was posing it for pictures I was kind of hoping it would break so that I had a reason to return it to Target. So no, I would not recommend this action figure or this line. Unless you are the type to keep things in the package, then maybe make sure to inspect before you buy because quality control is hit or miss. It looks as though Target got the jump on the first release of Stranger Things toys. However, Amazon and other retailers will eventually get them in as well.